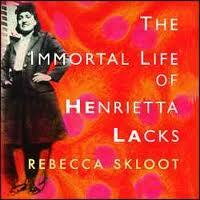 The Immortal Life of Henrietta Lacks – Around the World Through Books! Her cells traveled into space. Her cells redefined 20th century modern medicine, human health, and research for the polio vaccine, cloning, in vitro fertilization, and so much more. Her cells continue to live in thousands of medical and research facilities throughout the world. And yet, Henrietta Lacks — a native of Virginia — died in 1951. Participate in the upcoming Book Discussion and learn how Henrietta Lacks achieved a troubling but amazing and powerful immortality through her living cells. The winner of numerous awards and recognitions, The Immortal Life of Henrietta Lacks brings history, humanity, science, and ethics together in a fascinating story that focuses centrally upon one woman, one life, and her transformative impact upon the world. Read more about her story , see the book display in Parham Campus library, and attend the book discussion this week! Food? Light Refreshments will be served. Around the World Through Books is a free community event sponsored by the Multicultural Enrichment Council at JSRCC.